Pic It's a bit sturdier than the average Apple product, but the Curiosity rover that touched down on Mars on Monday is powered by the same processor family used in Apple's 1997 PowerBook G3 laptop. For its nuclear-powered life-hunting tank, NASA chose a 200MHz PowerPC 750 CPU specifically hardened to withstand radiation and space flight. It may not sound like much to a user of modern laptops (today's MacBooks feature 2.9GHz Intel Core i7 processors) or even an owner of a smartphone with a 1GHz dual-core CPU - but it's a significant power boost from the 20MHz IBM RAD6000 chips used in previous Mars explorers Spirit and Opportunity. The PowerBook G3 used a 233MHz IBM-Motorola PowerPC 740/750 processor. In Curiosity, the PowerPC 750 core is built into a BAE RAD750 package, which is hardened to withstand radiation - without such shielding, wave upon wave of charged particles from space will get into the electronics, altering stored values, affecting decision making within the chip or even permanently damaging the processor. The RAD750 is also toughened to survive the vibrations during launch and landing. 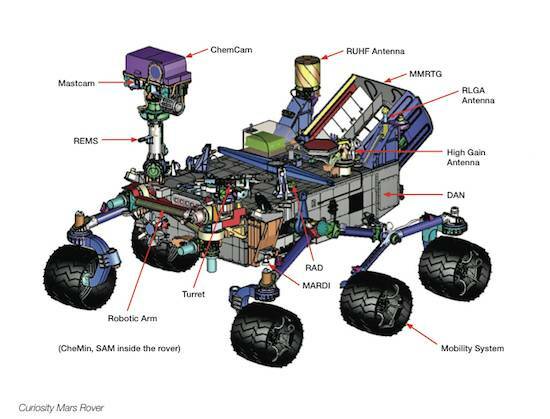 Curiosity also packs 256MB of RAM, 250KB of read-only memory (in an EEPROM that can be wiped if required) and 2GB of flash storage — which will be used to hold video and scientific data before it is transmitted to Earth. That would only hold 500 songs on an iPod, but again is a significant bump up from the 128MB of RAM and 256MB of flash on Spirit and Opportunity. Like any modern computer system, the first thing Curiosity did after landing was to check for an operating system update and install it.